Congratulations to the Catholic Mom Gospel Reflections team! 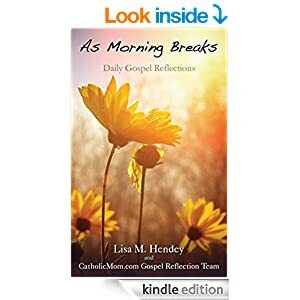 Their new ebook, As Morning Breaks, is burning up the Amazon charts. I’m not on that particular sub-team, but I am a proud member of the CatholicMom.com family, and I am very excited for all my fellow contributors who have worked so hard on this project. Proceeds from the sales will go to support the ever-growing hosting needs of CatholicMom.com. Help keep the CatholicMom.com team writing the good fight for you and all of us who are looking for quality, down-to-earth content that has meaning and brings joy to our lives. Download your copy of As Morning Breaks today!